To celebrate the launch of Valve's anticipated TCG - Artifact, we'll be giving away 50 copies of Artifact on our latest network site - ArtifactFire. To enter simply comment on our giveaway post on ArtifactFire, and don't forget - your account is network wide so all you have to do is log in with your VaingloryFire username and password! Comment Each Day To Increase Your Chances of Winning! 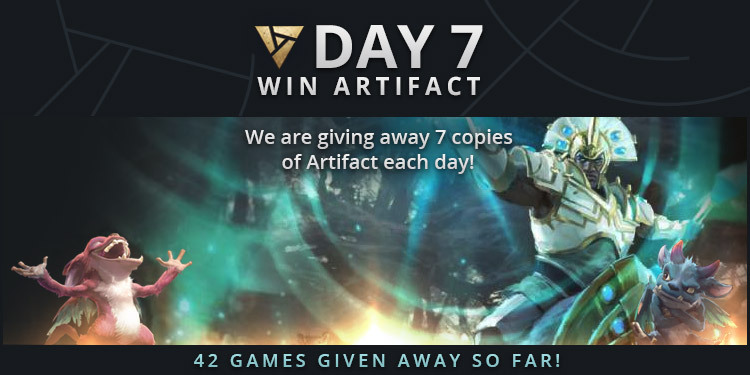 We'll be giving away 7 copies of Artifact every day, for 7 days. Each day you enter gives you another entry, so remember to enter each day during the giveaway to increase your chances! The winners of the previous day will be added to the giveaway post, announced on ArtifactFire's Twitter and Facebook, and the winners will be contacted via the email associated with their account. That Adds Up to 49, what about the 50th? The 50th copy to be given away will be special - and drawn after the rest of the copies are given away. The 50th copy can only be won by users who entered every day - so set your reminders and remember to enter each day! Good luck to everyone that enters, and I hope you're all as excited about this interesting addition to the card game genre as we are!